Roman Bath House re-discovered at Hovingham, North Yorkshire more than 250 years after it was first uncovered. All too often archaeologists talk about ‘new’ discoveries, a curious concept in world where the focus of study is about the past. During February and March 2008 the Landscape Research Centre undertook a geomagnetic geophysical survey at Hovingham as part of a project designed to gain some understanding of the scale of the archaeological resource in the Vale of Pickering that might be at risk from the extraction of aggregates. This work was part of a very large project concentrated in the eastern part of the Vale. In order to establish the degree to which the extraordinary results emerging on the sands and gravels between Rillington and Potter Brompton to the east of Malton reflected a more widespread picture small sample areas were examined elsewhere in the Vale for comparison. We were fortunate enough to be granted permission by the Hovingham estate to undertake a geophysical survey in the Park at Hovingham Hall where antiquarian discoveries pointed towards the presence of Roman structures. The survey was undertaken both to test the appropriateness of using gradiometery on the sands and gravels which fill the river valleys entering the Vale of Pickering at the western end but also to try and discover the location and context of a Roman bath house unearthed here in the early 18th Century when an ornamental canal was constructed during a massive landscaping campaign initiated by the 5th Thomas Worsley who inherited the estate in 1715.. This was duly published in 1882 as ‘The family memoirs of the Rev. William Stukeley, M.D., and the antiquarian and other correspondence of William Stukeley, Roger & Samuel Gale, etc (Volume 3)’ this is available for download as an e-book or can be read on the internet. Although the letter does not indicate the date of discovery of the Hovingham Bath House or for that matter much detail as to the nature of the discoveries it is however nevertheless very entertaining as a reflection of archaeological response times. Part of the letter is included below.. The letter then goes on to point out that a plate made by Virtue and funded by Lord Burlington was in London if he wished to have any prints made from it. The Society of Antiquaries of London has a copy of the etching as do the Worsley family at Hovingham Hall, the etching is reproduced below with permission of Sir William Worsley. 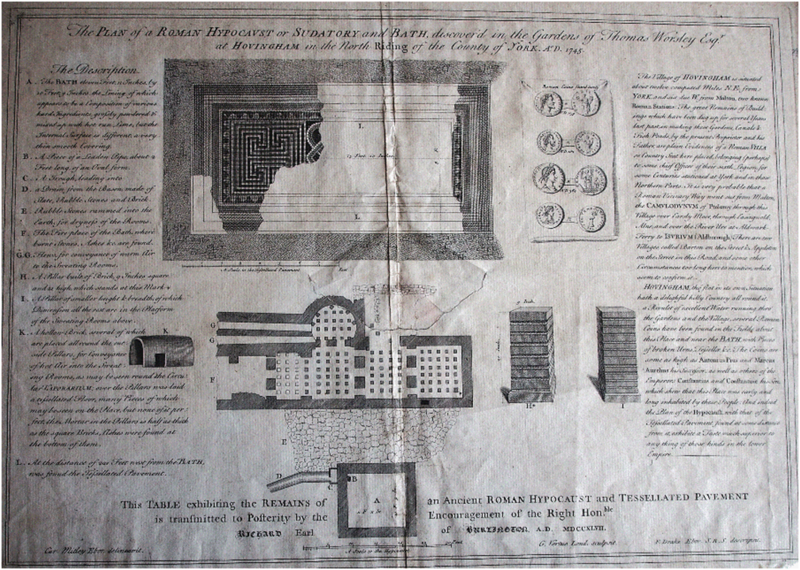 It shows parts of a Roman Bath House, some examples of the pilae (used to support heated floors in Roman bath houses), one of a number of tubuli (vertical flue pipes designed to heat the walls), a plan of a damaged room with a partial mosaic situated some 221 feet away from the Bath house, and references a few coins and other finds recovered during the uncovering of the structure. A small (less than 25cm square) fragment of the illustrated mosaic survives as a family heirloom. Although the location of the Bath House excavation is indicated on a map of the Park drawn in 1760 the precise location has remained unclear since. According to the late Sir Marcus Worsley the Canal itself was not a particularly successful feature of the park and by 1824 it had been re-modelled by opening out the western end into a broad but shallow lake, perhaps in the hope of increasing the water catchment to support the flow through the canal. In the end the limitations of the water supply meant that both the lake and the canal silted up and it became un-economic to maintain them as landscape features. Parts of the canal can still be detected on the ground through the survival of shallow banks on either side, but even the 1842 plan suggests that the site of the Bath House was obliterated by the lake extension and that the building with the mosaic was probably bisected by the stream which flows though the park and has most likely been lost entirely either as a result of erosion from the stream or enthusiastic antiquarian activity in the18th Century. 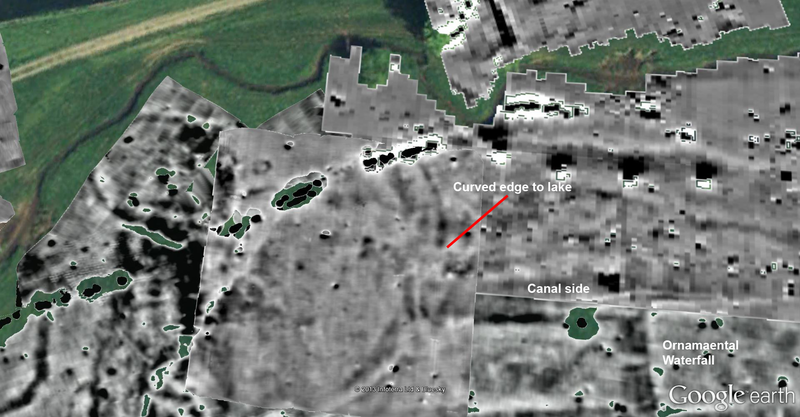 The original geomagnetic survey exposed many features relating to the ornamental canal and lake but failed to reveal the location of the Bath House, even using measurements from the early map to isolate the most likely location and undertaking a higher resolution survey than would normally be possible we could not see any convincing evidence of the structure. 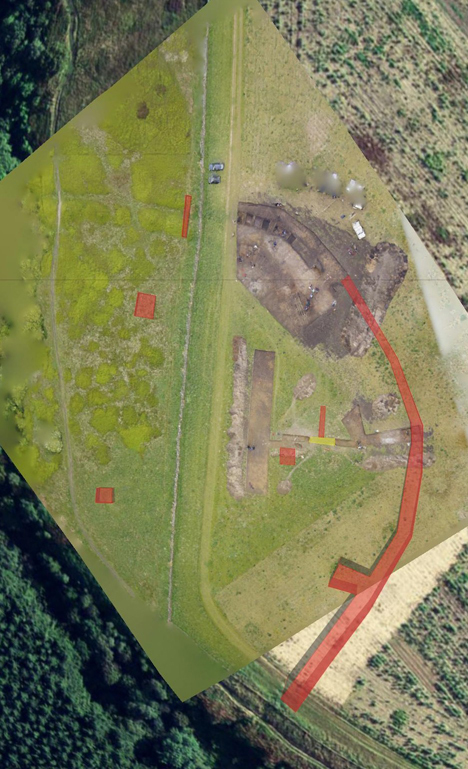 Elsewhere in the survey there were indications of possible walls, suggesting that the approach was not entirely inappropriate and thus that the Bath house remains had either been completely destroyed during the various enhancements to the park or that it was obscured as a consequence of the silting up of the canal and or lake. In 2013 it was decided that further research using alternative geophysical survey methods might give a better return than the geomagnetic survey. 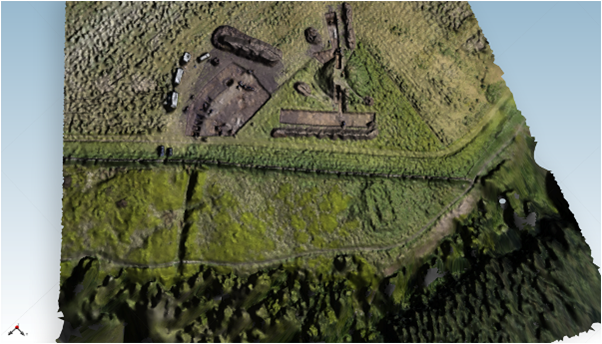 The Landscape Research Centre (LRC) has recently established a co-operative research agreement with the Initiative College for Archaeological Prospection (IC-ArchPro) at the University of Vienna, perhaps Europe’s leading archaeological remote sensing centre. The IC-ArchPro is at the forefront of developments in high speed high density geophysical survey and has a range of equipment not normally available to the LRC including a highly sophisticated multi-channel Ground Penetrating Radar (GPR) instrument. An appeal to the IC-ArchPro for help at Hovingham was given an immediate and positive response and a team from Vienna brought a range of instruments, including the high density radar instrument and undertook a large area survey at Hovingham between March 30th and April 4th 2013. GPR instruments are usually notoriously slow to use for archaeological survey as they tend to be very heavy and have to be dragged by hand across the survey area; the University of Vienna system is dragged by a quad-bike and also in contrast with conventional methods generates data that can be viewed within an hour of the survey completion, rather than needing several days of post-processing. The GPR works by transmitting and receiving radar pulses that are recorded as subsurface slices reflecting material density at different depths determined by the time taken for the radar signal to be returned to the instrument receivers. In the case of Hovingham the GPR was able to confirm that the walls of the bath-house buried at a depth of over a metre still survived beneath the present ground surface. 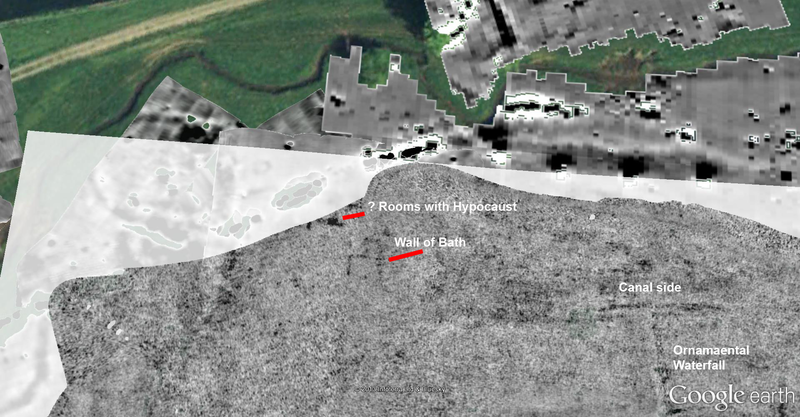 The mystery of the lost bathroom at Hovingham hall is now resolved, other walls identified nearby may indicate the presence of other structures in the immediate vicinity, but a shortage of time precluded further survey to see if the location of the building with the mosaic fragments could be found. It is now hoped that the team from Vienna will return later in the year to extend the survey area and try and identify the context for what in terms of plan looks like a rather unusual and large bath-house for its rural setting. Archaeological research in the Vale of Pickering over the last 35 years has identified an entirely unanticipated level of past activity, particularly around the margins of the valley which formerly held the largest inland body of water in Britain. Lake Pickering, which has featured in school geography lessons for many generations, mostly drained away about 12,000 years ago leaving a broad wetland with a network of interconnected lakes in the centre of the Vale and extensive light sandy soils on the margins of the valley, particularly in the eastern half. Air-photography, geophysical survey, excavations and other fieldwork undertaken by the Landscape Research Centre (LRC) and the Vale of Pickering Research Trust (VPRT) have completely transformed our understanding of the archaeology of the Vale from the Late Palaeolithic to Medieval periods. Although this research has been the subject of countless public lectures in Britain and abroad as well as numerous publications and exhibitions in Malton and in Scarborough its significance within the region, in Britain and Europe has not been widely appreciated. The focus of much of the research in the Vale has, in the case of the VPRT been on the landscape around the former Lake Flixton and the internationally important site of Star Carr, and in the case of the LRC centred on the huge excavations undertaken at West Heslerton and landscape scale surveys covering many square kilometres to the east and west. The results of both research programmes indicate that what we have seen up to now is merely a sample of much more extensive archaeological resources which show much higher past populations and, although apparently ‘unique’, are a reflection of the scale and intensity of activity we should expect in similar valley landscapes elsewhere in lowland Britain. The element of ‘uniqueness’ reflects, more than anything else, the level, intensity and focus of recent discovery and research but nevertheless it also highlights the importance and potential of the archaeology of the Vale. In the words of the former Chief Archaeologist for England David Miles ‘the buried landscape of Heslerton is every bit as important as Stonehenge‘. In 2011-12 English Heritage commissioned the production of the ‘Vale of Pickering: Statement of Significance’, a document designed to highlight the nature and importance of the heritage of the Vale. The preparation of a Statement of Significance is the first stage in developing an overall strategy for the Vale of Pickering, as part of the Vale of Pickering Historic Environment Management Framework Project, initiated by English Heritage (Yorkshire and Humber Region). The Statement of Significance document has been prepared by Dr Louise Cooke in collaboration with a wide range of stakeholders, both organisations and individuals, representing a range of different backgrounds and interests including cultural and natural heritage, and planning. The document is designed to be used by many from heritage agencies and planners to school teachers and academics to underpin planning policies that help sustain heritage resources or the development of long term research strategies to enhance a more detailed understanding of the fragile evidence of the past which is increasingly under threat from industrial farming and other developments. The document is summarised in ‘The Vale of Pickering an Extraordinary Place: Statement of Significance’ which can be downloaded by clicking on the link here. Data collection and archaeological interpretation are complicated by apparent gaps in the evidence, whether in excavation, geophysical prospection, remote sensing, field survey, environmental analysis or artefact studies. How can we tell whether such ‘gaps’ represents an absence of evidence, a failure to see evidence that is potentially available, the removal of evidence that was once present or a real gap in the activity or sequence that we are studying? To what extent can we cope with such uncertainties when moving from data assembly to realistic archaeological interpretation? Ambiguities of this kind are inherent in archaeology as a study based on the observation of material evidence. The seminar will explore these challenges through discussion between a dozen argumentative speakers and thirty or so interested students, teachers, researchers and practitioners, both at the initial seminar and in web-based discussion afterwards. Subjects covered will include aspects of excavation, field survey, geophysical prospection, aerial survey, landscape interpretation, environmental reconstruction and the use of numismatic evidence. If the seminar and its subsequent web-based discussion are successful consideration will be given to the promotion of similar events in future years. Why are there holes in aerial data? And do we need a typology of gaps? So few pieces of the jigsaw! Just how good can our landscape and palaeoeconomic reconstructions be? PRELIMINARY EXPRESSIONS OF INTEREST ARE INVITED FROM INDIVIDUALS, IN WHATEVER FIELD OF ARCHAEOLOGICAL RESEARCH, WHO FEEL THAT THEY COULD CONTRIBUTE TO AND/OR BENEFIT FROM THIS KIND OF DISCUSSION. Presence throughout the full 2½ days of the discussions is obligatory, at an all-in residential cost of about €150 per person (non-refundable deposit of €50, plus remainder on arrival). Register your interest, please, by emailing campana@lapetlab.it as soon as possible, including a very brief statement of your past experience and reason for wanting to take part. Further details and an application form will be available via the ArchaeoLandscapes website (www.archaeolandscapes.eu) in mid-February. Firm applications to be submitted by 1 March. Full inscription and payment of deposit by selected participants will be confirmed in mid-March. Limited financial help, through the ArchaeoLandscapes Europe Project, will be available for those who cannot meet the full cost of attendance and travel from their own or other sources. The seminar forms part of the ArchaeoLandscapes Europe Project within the Culture Programme of the European Union, managed in this case by the Roman-Germanic Commission of the German Archaeological Institute in Frankfurt. The event is being organized by Stefano Campana of the Laboratory of Landscape Archaeology and Remote Sensing (LAP&T), University of Siena, in partnership with Chris Musson and Prof Dominic Powlesland of the Landscape Research Centre in the UK. Archaeological air-photography, recording the texture of past human activity in the landscape, can be a tremendously exciting exercise. Crop-marks reflecting the differential growth of crops over buried archaeological features or structures which retain more or less moisture and nutrients than the natural undisturbed soils, need not necessarily result from features created in antiquity. Flying last year with the expert air-photographic pilot Anthony Crawshaw we saw these splendid patterns in fields towards the western end of the Vale of Pickering. The example below with radiating lines extending out from central dark features does not represent the landing pads for alien spacecraft, or for that matter the launching stations for flying pigs, but the radiating paths from central feeding stations for outdoor pigs. The crop-mark reveals compressed paths followed by the pigs which has retarded growth in the crop, there is also some stratigraphy here as well with overlapping features showing changes in the layout of the pig-pens over time. 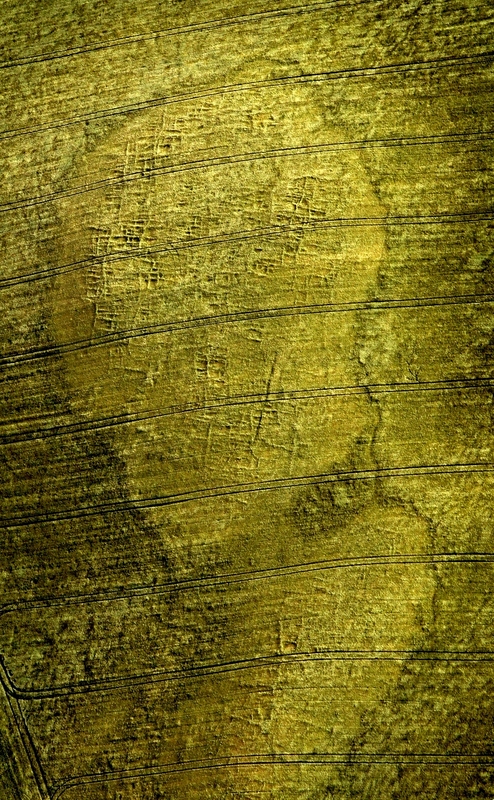 Crop-marks can also be caused by variations in the subsurface geology. Sometimes these marks are simply very attractive, as in the example below. This has the appearance of a Middle-Eastern Prehistoric settlement with interconnected mud-brick buildings contained within a walled enclosure or lots of tiny fields. The crop-mark here reflects cracks in the underlying limestone geology. Boltby Scar excavation director, Professor Dominic Powlesland and print-maker Paul Musgrove will combine forces to deliver two talks at the North York Moors National Park visitor centre at Sutton Bank on May 10th. starting at 7.00pm. Dominic will discuss the current phase of research on this much damaged but regionally important hill-fort and Paul will discuss his archaeologically inspired artwork, currently on exhibition at Sutton Bank. The Boltby Scar excavation open days this year will be the 19th and 20th of May by which time we hope to have answered many of the outstanding questions regarding the nature of this remarkable site which contributes to our understanding of the landscape of the North York Moors and its people from c.3600BC until 1000AD. 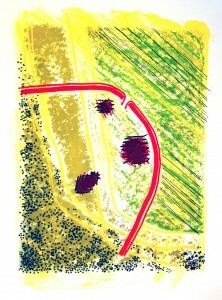 We are delighted to continue our collaboration with print-maker Paul Musgrove, which began with the creation of a series of etchings and Japanese woodblock prints derived from the results of LRC excavations, geophysical and aerial surveys in the Vale of Pickering and exhibited at Scampston Walled Garden in 2011. This year he has created a series of screen prints based on the work in progress at Boltby Scar, which are now being exhibited at the North York Moors National Park visitor centre at Sutton Bank. Click on the image below to go to Paul Musgrove’s web-site. Boltby Scar 3D model showing with the Z scale multiplied by 5 to emphasize the topography over the preserved Hillfort section in the lower part of the image. Archaeological excavations at Boltby Scar, North York Moors National Park will take place between 30th April and 21st May 2012. The Landscape Research Centre and a team drawn from the NYMNP volunteers and undergraduate archaeology students from the University of York will try to trace the full extent of the palisaded enclosure, identified in 2011, learn more about a middle Neolithic structure and its relationship to the stone ring sealed beneath an early Bronze Age barrow and investigate a number of areas in the upstanding section of the late Bronze Age/early Iron Age hill-fort in the search for dating material and evidence of domestic activity. This will be the final season of the current phase of excavation on this monument the examination of which is transforming our understanding not only of this badly damaged late Bronze Age/early Iron Age hill-fort but also of activity and the environment from the Neolithic to Medieval periods. The dates and times of open days will be announced on this blog and on the Boltby Blog once they have been confirmed.